Multiple Power Sources, powered by free AC adapter or free come with 78" USB power cord or free 3AA Batteries, very convenient. 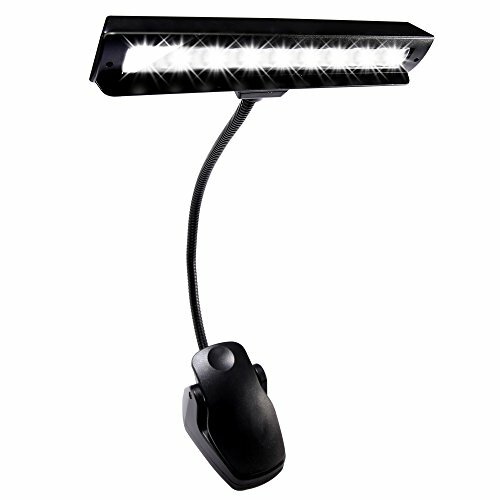 Fully adjustable, and lightweight, - 1 Arm (Goose neck) and 9 Powerful LED Lights. Notes: Please kindly remove the thin wrapper around the batteries before installing. Large Area of Lighting: With a large area of illumination, spreads light evenly on the your music sheets. Fully adjustable arm can be bent randomly, free to choose the area to be illuminated. Free AC adapter, free 78'' USB Cable, free 3AA batteries (most other brands not included)-could also be used a emergency night lamp when power cut. The clip can be opened enough to grip onto a rather thick novel and is gently padded to avoid any damage to the surface being clamped. 9LEDs' locations are precisely engineered to spread light evenly in a wide coverage. Low power consumption, low heat generation, durable LEDs last 100,000 hours - no replacement necessary. Backed by the Hallomall customer satisfaction guarantee. We will always replace a faulty product or refund your purchase. Just contact us if you have any problems.